The CSJ women’s basketball USCAA National Championship team are hands on with a game ball. This past week was all about the USCAA National Basketball Tournament for both the men’s and women’s teams at College of St. Joseph. 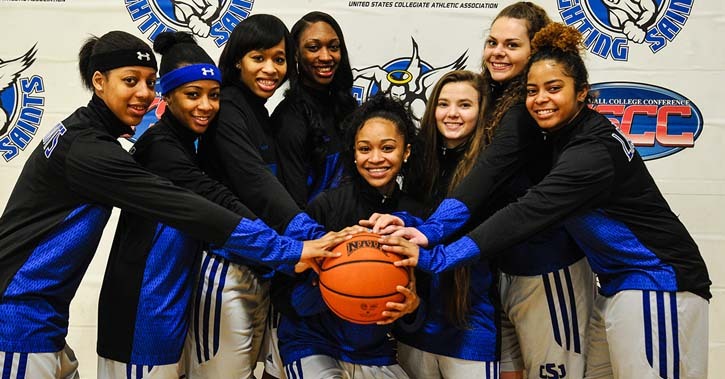 The Lady Saints defeated Albany College of Pharmacy and Health Sciences 72-46 to take home CSJ’s first ever USCAA National Championship on Saturday. The Lady Saints have put together an incredible campaign that may go down as the single best sports season for any team in CSJ’s history. They ended their undefeated conference season 31-1 overall with a 29 game winning streak to earn the National Title. Their only loss came back in late November to NCAA Division I team NJIT. The Fighting Saints men’s basketball team was not as fortunate as their female counterpart in the USCAA Tournament. They were able to win the opening round against University of Maine at Presque Isle but lost to the No. 1 seed Berkeley College in the second round, the same team that sent the Saints home early during the same tournament last year. Although they did not accomplish their final goal, it was still a solid season for St. Joe’s. They finished with a 12-1 YSCC conference record and went 20-11 overall. Here is a closer look at how the tournament went down for both teams. The men’s team opened up the tournament with a down-to-the-wire victory against University of Maine at Presque Isle that ended with a score of 75-71. The Saints overcame a 19-point second half deficit to advance to the quarterfinals of the Men’s Division II Tournament. CSJ was led by Antonio Gordon off the bench, who led all scorers with 29 points, including a three-point bucket with 25 seconds left to play in order to secure the win. The top seeded Lady Saints started off the tournament by defeating the Penn State Fayette Fighting Lions 81-56 in the Women’s Division II quarterfinal match up. In a game that was close early, CSJ pulled away late in the first quarter and would never look back. Jazz Laracuente scored a game high 22 points with eight assists and five steals. Regina Steele had a double-double with 16 points and 19 rebounds. Fighting Saints men’s basketball lost to the eventual National Champions Berkeley College in the quarterfinal round with a final score of 69-88. It was close throughout the first half, but Berkeley was able to extend the lead to double-digits in the second half and they never looked back. CSJ’s Antonio Gordon led all scorers with 18 points on 6 of 12 shooting. Kareem Brown was the only other Fighting Saint to score double figures, finishing with 14 points. The Lady Saints continued their dominance in a semifinal matchup against Penn State Beaver, earning a 92-71. CSJ’s Jazz Laracuente and Mookie Kennedy combined for 51 points in the victory. Arreonte Anderson and Regina Steele chipped in 19 and 15 points, respectively. CSJ claimed the 2016 USCAA Women’s Division II title Saturday, defeating #3 Albany College of Pharmacy & Health Sciences (20-5) by a final score of 73-46. First-Team All-American Jazz Laracuente led the Lady Saints with 22 points. Regina Steele and Arreonte Anderson each turned in double-doubles for CSJ, with Steele’s line reading 18 points, 12 rebounds, 4 steals, and 4 blocks, while Anderson went for 14 points, 14 boards, and 4 steals. Mookie Kennedy scored 17 points and recorded 5 take-aways for the Fighting Saints as well. Steele was named Women’s Division II Tournament MVP, while Laracuente and Anderson earned Women’s Division II All-Tournament Team.